What are my options in bicycle storage racks? Bicycle storage racks give your customers or employees a place to store their bikes while they’re shopping, walking, working, attending classes, or watching an event. There are various sizes to choose from so you will have the option of how much area you designate for those that ride a bike to your building. Choosing one 20 foot bike rack can be done just as easily as arranging four bike racks that are five feet long in a smaller area. Single sided and double sided options give you further choices on how many bikes the frame is able to store at once. There are bollard bike racks for city buildings where there is high traffic and extra safety is required. 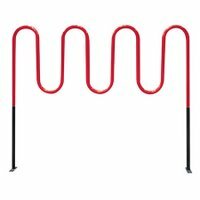 There are low profile racks for any niche area and the "Wave" bike rack is available in a bright thermoplastic coatings in 21 color choices! Solid plastic cubby organization niche systems are ADA compliant. 1) What is a Cubby Locker? A Cubby Locker is a simple temporary storage device or cabinet system designed for children. It is an “open” locker with no door. 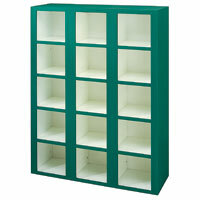 2) Why do I need Cubby Lockers for my school / church / daycare center? The parents of small children typically give them many items when the children are visiting these types of locations. That would include lunch boxes, backpacks, coats and clothes, books, homework and many other things. The Cubby Lockers provide an easy and effective way to store these many items for the children. 3) Are Cubby Lockers safe for small children? Absolutely !!! They are made from a non-toxic plastic known as high-density polyethylene (HDPE). They meet all US and Canadian standards for non-toxic finishes. There are no sharp edges or corners to cut little hands and they are also ADA compliant. XPB Lockers & Supply carries a wide variety of Lockers, Mailboxes, Commercial Lavatories, Bleachers and Commercial Outdoor Furnishings delivered nationwide. If you can not find what you are looking for call us toll free at 1-877-483-9270 and we will find it for you. Our home office is located in New Braunfels, Texas with distributors located in all 50 States including Houston, TX, New York NY, Los Angeles CA, Miami, FL. Chicago, IL. Denver CO., Dallas TX, San Antonio, TX., and Austin, TX. Heavy duty bollard bike racks for bicycle parking and building security. 1) What is a Bollard Bike Rack? It is vertical obstruction usually made of heavy steel. It is a dual purpose device that restricts access to motorized vehicles as well as serving as a place to chain and / or park bicycles. 2) Where would one place Bollard Bike Racks? They are usually placed where property owners or communities want to limit access to motorized vehicles. Typical areas of placement would include pedestrian walkways, dormitories, public buildings, hiking trails and bicycle trails. 3) Are Bollard Bike Racks effective? Yes they are !!! It would be a serious mistake for a car or truck owner to try and “run over” a Bollard Bike Rack. He or she would incur serious damage to their vehicle because these bike racks are made from very strong and thick steel. They are designed to keep motorized vehicles out of certain areas and they do that job very well. XPB Lockers carries a wide variety commercial outdoor furniture, commercial industrial sinks, commercial mailboxes, bleachers, and commercial signage delivered nationwide. If you can not find what you are looking for call us toll free at 1-877-483-9270 and we will find it for you. Our home office is located in New Braunfels, Texas with warehouses located throughout the United States that enable us to service all 50 states including New Orleans, La., Cleveland, Ohio, Kansas City, Mo., Mesa, Arizona, Virginia Beach, Va., Omaha, Nebraska, Oakland, California, Miami, Florida, Tulsa, Oklahoma, Minneapolis, Minnesota, Colorado Springs, Colorado, Houston, TX, Arlington, Texas, Beaumont, Texas, Denton, TX, McKinney, Texas, Midland, TX, Killeen, Texas, ALBQ, NYC, LA, MPLS. Commercial washroom stall wall privacy screen partitions construction. Why do I need Toilet Partitions? It is essential to offer security and privacy in restrooms. The public demands and expects these features in all public and most private buildings. The elegance and privacy of our Quick Ship Toilet Partitions will please any user. What is the useful life of Toilet Partitions? Our stainless steel Quick Ship Toilet Partitions will last decades under normal use. The metal itself will last forever. Our Baked Enamel Quick Ship Toilet Partitions will last several decades or more under normal use and are our most economical alternative. What configurations do you offer for you Toilet Partitions? We offer all common configurations including Floor Mount-Overhead Braced, Floor Anchored, Floor to Ceiling and Ceiling Hung formats. What do you use to clean your Toilet Partitions? Any mild liquid soap will be sufficient to clean our Quick Ship Toilet Partitions. Avoid the use of harsh or abrasive cleaners. Do you sell Urinal Screens? Yes, we offer a selection of Quick Ship Urinal Screens in a variety of configurations, sizes and colors. Secure locking brass cluster mailboxes for secure postal customer service. What type of customer would buy Commercial Brass Mailboxes? Many different organizations have a need for a durable and secure method of mail distribution. They would include: apartments, condominiums, office buildings, private postal centers, corporate mail centers, military bases, colleges, universities and schools, government agencies, corporate mailrooms, military bases, police stations and business facilities throughout the world. What advantages do Commercial Brass Mailboxes have? Their first advantage is the attractiveness. Their second advantage is their durability. Their third advantage is that they are corrosion resistant. Are Commercial Brass Mailboxes painted? No, there is no need to paint them since they are corrosion resistant. A layer of lacquer is applied to delay and lessen the darkening process that occurs over time. What type of security does a Brass Mailbox offer? The user must have a key to retrieve his / her mail. 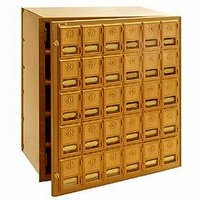 Where can I find Commercial Brass Mailboxes? XPB Lockers carries a wide variety of commercial mailboxes, including lockers, outdoor furniture, commercial lavatories and bleachers delivered nationwide. If you cannot find what you are looking for, please call us toll free at 1-877-483-9270 and we will be pleased to help find it for you. Our home office is located in New Braunfels, Texas with warehouses located throughout the United States that enable us to service all 50 states including Seattle, Washington, Chicago, Illinois, Baltimore, Maryland, Pasadena, Texas, Amarillo, TX, Brownsville, Texas, Houston, Texas, Grand Prairie, TX, Pasadena, Texas, Fort Worth, Texas., San Antonio, Texas, Salisbury, N.C., Milwaukee, Wisconsin, Boston, Massachusetts, Salt Lake City, Utah, Billings, Montana, Tulsa Oklahoma, and Los Angeles, California. 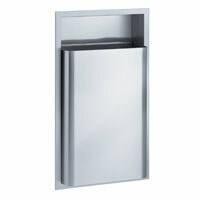 Commercial washroom wall mount, recessed and free standing waste receptacles. 1) What type of Commercial Bathroom Waste Receptacle is the most economical? When considering the total cost of this type of product, attention should also be given to the cost of repair and maintenance over the live of the product. Since the cost of repair and maintenance of Stainless Steel bathroom waste receptacles is extremely low, the overall cost will be the most economical over time. 2) What type Commercial Bathroom Waste Receptacle is the most sanitary? The most sanitary type of receptacle is one made from Stainless Steel. It is rust-proof and bacteria resistant. It is easy to clean with commercial cleaners. No doubt about it - stainless steel. 3) Which mounting option should I select? Your mounting option depends on your space limitations and the desired appearance. We are always available to advise you on this topic. XPB Lockers & Supply carries a wide variety of Commercial Bathroom Accessories, Lavatories, Commercial Outdoor Furnishings, Storage Lockers, Commercial Mailboxes and Bleachers delivered nationwide. If you can not find what you are looking for call us toll free at 1-877-483-9270 and we will find it for you. Our home office is located in New Braunfels, Texas with distributors located in all 50 States including Houston, TX, New York NY, Los Angeles CA, Miami, FL. Chicago, IL. Denver CO., Dallas TX, San Antonio, TX., and Austin, TX. Commercial restroom privacy bathroom stall wall partitions. What are my choices for bathroom partitions? Privacy partitions are available in various materials, including stainless steel, baked enamel, solid plastic, plastic laminate and solid phenolic core. Furthermore, they can be mounted to different areas in the bathroom. You can choose from floor braced, ceiling hung, overhead braced, and floor to ceiling bathroom partitions. Each type of wall partition will work best in certain types of bathroom designs. Applications include ADA approved stalls, between walls, in-corner and freestanding compartments. Learn more about privacy partitions and green bathroom technology by consulting a professional with XPB Lockers and Supply. XPB Lockers carries a wide variety of commercial bathroom partitions, commercial mailboxes, lockers, outdoor furniture, commercial signage, and bleachers systems with professional affiliates ready to help your with your business plan. We delivery nationwide! If you cannot find what you are looking for, please call us toll free at 1-877-483-9270 and we will be pleased to help find it for you. Our home office is located in New Braunfels, Texas with warehouses located throughout the United States that enable us to service all 50 states including New York NY, Los Angeles CA, Miami FL, Chicago IL, Denver Co, El Paso TX, Dallas TX, San Antonio TX, Austin TX, Houston, Texas, Boise ID, Atlanta, GA, Detroit MI, Raleigh-Durham NC, Washington DC, Albuquerque NM, Huntsville AL, Fayetteville AR, Norfolk VA, Madison WI. Octagonal picnic tables and history of bench picnic table designs. 1) What is the advantage of an Octagonal Picnic Table? 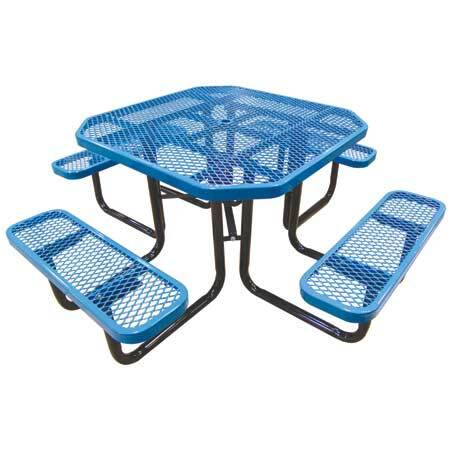 The design of an Octagonal Picnic Table makes it easier to seat more people. It is a more comfortable design than a standard square table and in addition, it is very attractive. 2) Why should I buy your metal Octagonal Picnic Table? This picnic table has many unique features that make it an excellent purchase for any family or organization. Among the many features is that it is very durable and rust, corrosion and scuff resistant. It will last for decades and is portable – it can be moved or stored for periods of time. 3) What is the best material to use in the construction of an Octagonal Picnic Table? There is no one best material because each material has its advantages and disadvantages. However, plastic-coated metal is very durable and cost effective and that makes it a very popular choice. 4) What is the history of the picnic table in the US? It appears that picnic tables may have arrived as early as the late 1800’s and were used in public gathering places in small towns throughout America. Picnic tables are sometimes referred to as picnic benches and are basically a modified table with built-in benches on both sides. Children's personal metal storage locker furnishings. Why do I need a Kids Locker? Your children will accumulate toys, games, sports gear, schoolwork, creative projects and clothes in a very short period a time. As a parent you can help them organize their belongings and become more organized and responsible. Your home will be far less cluttered and your children will have a secure location to keep their things. Lockers are tough and durable – tougher than kids. They will absorb the use and abuse that is dished-out daily by active children. Constructed of 24 gauge steel with 16 gauge doors, Kid’s locker dimensions are 54" high, 15" wide and 15" deep. They are made from industrial sheet steel and will definitely last longer than the childhood years of your children. There are a variety of locks can be used in conjunction with the recessed latch. Therefore your children can protect their possessions from the curious hands of their siblings. Learn more about Kids lockers and a variety of other storage products by contacting a professional with XPB Lockers and Supply. XPB Lockers carries a wide variety of lockers, commercial mailboxes, outdoor furniture, commercial lavatories and bleachers delivered nationwide. If you cannot find what you are looking for, please call us toll free at 1-877-483-9270 and we will be pleased to help find it for you. Our home office is located in New Braunfels, Texas with warehouses located throughout the United States that enable us to service all 50 states including Seattle, Washington, Chicago, Illinois, Baltimore, Maryland, Pasadena, Texas, Amarillo, TX, Brownsville, Texas, Houston, Texas, Grand Prairie, TX, Pasadena, Texas, Fort Worth, Texas., San Antonio, Texas, Salisbury, N.C., Milwaukee, Wisconsin, Boston, Massachusetts, Salt Lake City, Utah, Billings, Montana, Tulsa Oklahoma, and Los Angeles, California.